Analysis of the Yemen crisis recalls a lost narrative. This article was originally published at THRU.Media on June 5, 2015, as “Yemen Crisis and the Wheel of Contradiction.” It has been edited for quality without updating information or altering the original narrative. The Yemen Crisis only recently grabbed my attention during the usual morning routine of reading the news over breakfast. A story of violence, destruction, extremism, and political crisis breaks nearly everyday. Not only are there too many civil wars going on around the world to keep track of, they tend to read like sports analysis detailing the offense and the defense and how their plays were executed from each side. I’ve been focused on Syria and Palestine, but Yemen has had enough compelling detail to it that I had to carve out a couple days to research and digest the matter. The history of Yemen reveals internal collusion with al-Qaida and the exploitation of the United States War on Terror. Before researching this essay, I was only clear on the fact that Saudi Arabia’s air campaign in Yemen was against a militant faction called The Houthis. Now I understand that the Houthis deposed President Hadi from office and palace early this year. Hadi fled to Riyadh, Saudi Arabia. The Houthis have staked claim over the government by controlling the capitol, Sanaa. Saudi Arabia claims that the Houthis are a proxy force of Iran. Rumors of al-Qaida and Islamic State expanding their presence, thanks to the chaos of the scene, have been circulating. Setting the stage is a long time conflict between north and south Yemen, and a corrupt President who used terrorism to maintain power for decades. There is a religious and tribal connection that can be traced back generations, even if the exterior of the conflict is a modern political one. A fair place to begin is the Shia versus Sunni Islam conflict at play: Shi’ite Houthis hold a majority in the north while Hadi comes from the Sunni-dominant south. Iran is majority Shia, Saudi Arabia is majority Sunni. Al-Qaida is Sunni and Houthi is Shia. Both Houthi and al-Qaida roots go back in the 1980’s, and both took a turn with the collapse of Afghanistan’s Soviet-backed government in 1991, with the disintegration of the U.S.S.R.
Osama Bin Laden operated a terrorist training camp in Afghanistan and believed that Yemen had an important role to play in global jihad. His influence produced terrorist groups like Islamic Jihad in Yemen, Army of Aden, and eventually al-Qaida in Yemen, throughout the 1990’s, so that by September 11th, 2001, there was already a history of Yemeni attacks from Islamist militia against western nations. Hussein al-Houthi established the Believing Youth movement in 1992 to teach Zaidi Islam through school programs and summer camps. With 20,000 student attendees of the summer camps by 1995, there was a growing cult-like following in reverence of the al-Houthi family. Its teachings included lectures from Hassan Nasrallah, now Secretary General of the Lebanese political party with armed forces, Hezbollah. President of North Yemen throughout all of this is Ali Abdullah Saleh. He rose through the ranks with a vicious military career in the Yemen Arab Republic from 1960 to 1980. By 1983, he was President, and remained in that position until Soviet-backed South Yemen collapsed, like Afghanistan. He swiftly absorbed the South and became the first President of the new unity government. Saleh worked with the United States as an ally in the region, supporting Kuwait in 1990, and was supported in return for resisting communist insurgencies subsequent to the fall of the Soviet Union. Marxist secessionists sought regional liberation from the rule of Saleh. To squash insurgencies, Saleh utilized unemployed jihadists from Afghanistan trained by Bin Laden. These terrorists would evolve into early al-Qaida formations. In 1994, the Vice President of Yemen is appointed by the name of Abd Rabbuh Mansur Hadi, recognized for his military role in keeping the secession movement down. His role in the administration is ceremonial. Houthis were relatively quiet until anti-west sentiment developed after the U.S. invasion of Iraq in 2003. They got Saleh’s attention as their numbers had grown and they had become increasingly armed. Without any particular provocation, members of the movement were arrested. Hussein al-Houthi launched the first insurgency against Yemen in June 2004 and was killed on September 10th. Every year since, there has been some kind of offensive measure from the Houthi movement. By 2011, they played a meaningful role in the revolution that ousted Saleh. That revolution was part of The Arab Spring, which is an ongoing geopolitical struggle. It has been a violent process but also led to international reforms and liberated many people from oppressive government rule. The nations still seeing great unrest are dealing with waves of humanitarian crises, civil war, and terrorism. 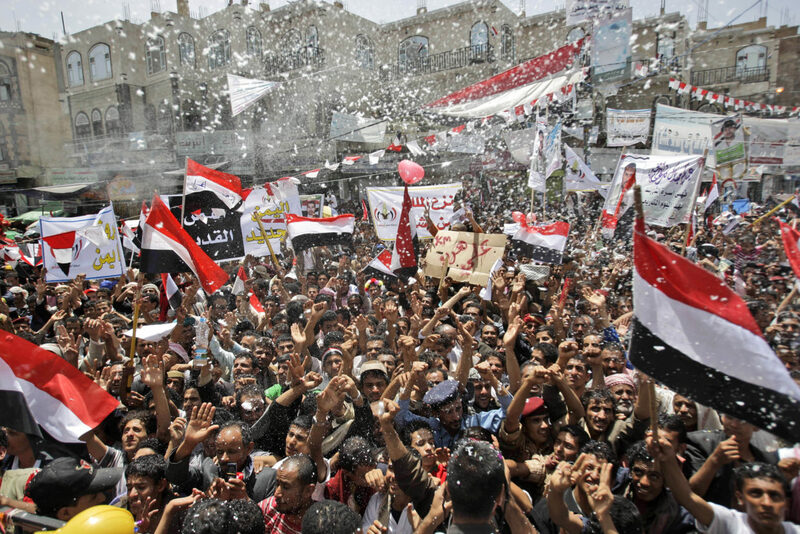 The Yemeni Revolution has been one of the most unstable movements in the bunch. One major yet ignored backdrop to the whole conflict is that Yemen is experiencing the greatest water crisis in the world. The prospect of Yemen being the first to run out of water has been rumored for many years, and yet, to this day, nothing is properly being done about it. Post-revolution reforms were met with a lack of political will from Hadi’s government. Social instability is a massive distraction. In a nation where 75% of men are addicted to a legal stimulant-narcotic known as qat, where food crops are being replaced by the demand for and profit from qat, where water drilling is unregulated, where cultivation of qat is estimated to be responsible for as much as half of the disappearing water table (6.5 feet per year), where nearly half the population is hungry, there is a severely torn social fabric, communities are reeling and desperate, and something has been deeply corrupting the government. For about one year after the revolution, Saleh remained President but essentially powerless. His successor, Hadi, was elected amidst unrest and instability. He was unopposed. By 2014, it seemed that his rule, though flawed, was likely to continue with reelection in 2015. This is when the Houthis started to dig in. Houthis rose to victory, building their control and support from the north, and in the summer of 2014, they descended upon the central capitol of Sanaa. On January 22nd, Hadi was run out of the Presidential Palace, resigning from office along with his entire cabinet, escaping to Riyadh, where Saudi Arabia took him as the President-in-exile. Abdel Malik al-Houthi became the first President of the Revolutionary Committee of Yemen. When they took the city by force and marked their territory like a gang, dissolving parliament and forming this farcical Revolutionary Committee, a considerable portion of the Yemeni public, Arab Gulf Cooperation Council, and United Nations called it an unwelcome coup d’tat. It took about two months of failed peace talks mediated by United Nations for Saudi Arabia to intervene militarily. The UN condition was that Hadi would remain in office and his government would be restored. That is a difficult pill to swallow, so it is understandable that Houthis would capitulate. February and March continued without the successful formation of a new government. Al-Qaida and Islamic State would infiltrate the insecure nation, to simultaneously fight the Houthi uprising and thwart the return of Hadi’s regime. Before Hadi was rushed out of the country, Houthi protests in Sanaa were violently squashed with security forces under Hadi’s command opening fire on peaceful crowds. Rutgers Associate Professor of Middle East studies, Toby Jones, speaking on Democracy Now, points out that Yemen has been a fractured, troubled nation for longer than the Houthi insurgency. He acknowledges that the Houthis had accomplished nothing “but [to] kill a thousand Yemenis.” Both politically and socially, they are stuck, but he stresses that they are one among many factions calling for political solutions while staging peaceful protests. The mission of Decisive Storm was to degrade Houthi capability and was announced as a success on April 22. The following mission, Renewal of Hope, began immediately on the 23rd. In a personal narrative from Casey L. Coombs, an American journalist stuck in war-torn Sanaa and landlocked thanks to Saudi bombing, describes the desertion of a usually thriving city and the difficult circumstances of taking a commercial flight in an occupied nation where Saudi jets have bombed the airport. The story about Iran supporting the Houthis militarily has been published many times in numerous publications, yet the assertion is flawed. Beyond the possession of weapons traceable to Iran, there is no evidence of direct collusion as a proxy actor. Merely tracing arms to a weapons manufacturing nation is virtually irrelevant, and the double-standard glares when you look at al-Qaida or Islamic State weapons that are traceable to the United States. It is however a matter of public foreign policy that the Saudi government helped keep in place a failing regime with Hadi as the head, surrounded by former President Saleh’s family members. April and May of 2015 were characterized by failed ceasefire attempts and continued bombardment from the Saudi-led coalition, which included all Gulf-region nations and other allied countries. Accusations from the UN against the coalition have circulated about the dropping of cluster bombs, an indiscriminate weapon of mass destruction. Al-Qaida continues to be targeted in the south by American drones, even as jets bombard their Houthi enemy. On May 11, Saleh announced his alliance with the Houthis after his home in Sanaa was bombed by the coalition, killing three guards while leaving him apparently unscathed. This lends all forces loyal to Saleh over to the Houthi cause, to engage in a desperate attempt at retaining power. A former al-Qaida member and informant to Yemeni anti-terrorism units under Saleh has cast alarming accusations on the deposed President and his military between 2006 and 2011. Hani Mujahid provided information that could have thwarted two terrorist attacks, one targeting Spanish tourists, the other targeting an American Embassy. That Saleh was both creating and controlling al-Qaida in Yemen with U.S. backing in order to receive foreign aid is made credible by the Mujahid revelations, and supported by outspoken U.S. authorities. The post-revolution government that was backed by Saudi and U.S. diplomats left many of the same military officials in place. The Houthi coup points mostly to the political impossibility of reforming an overthrown regime into a satisfactory democracy by using that same old regime. Yet this plan is what the international players are fighting for. My persistent question is, Why? To give the international players the benefit of doubt, I could suggest Hadi is currently supported because during his three years of rule, he gradually reorganized the military with a certain bias for cutting out the Saleh power hub. It seems that the process has continued in exile. Yesterday, following the Mujahid revelations, by Presidential Decree (in exile) Hadi relieved Brigadier Ammar Mohammed Abdullah Saleh (nephew of President Saleh) from his post in Ethiopia. Hadi’s presence in Yemen is by proxy, making few public appearances. His strategy has focused on international relations, unlike his predecessor, who could work with opposing factions in a masterfully sociopathic kind of way, politically effective in dealing with homegrown issues. Hadi, as Vice President, and now President, cannot be disconnected from the corruption, from aiding al-Qaida. He pushes back against Saleh’s rule, but not substantially. His relationship to real civilians is disconnected after 21 years at the top of Yemen’s government, with a reputation for cracking down on people’s movements. On June 3, peace talks were arranged for June 14, in Geneva, moderated by the United Nations. This came after the deaths of at least 58 Yemenis under coalition bombing last week. The conflict has seen over 2000 related deaths, with many more injured, and half a million refugees since the start of the Houthi insurgency. In Yemen, public support for a Houthi regime is simply vanishing, despite all the real damage done by coalition air strikes. It is strange that Houthis would be willing to align with Saleh, the same man who had their leader killed. They might gain something valuable in the short term, but they will lose public support. That Saleh would turn against al-Qaida is not surprising considering that he used them to get on America’s good side. When a Saudi air strike degrades Houthi territory and capability, al-Qaida is conveniently there to dig in. Saleh probably just has nowhere else to turn but against the enemy of his enemy. Saleh intentionally manipulated America’s War on Terror toward personal gain. Saudi Arabia did not commence air raids on his government. It was only when that government was removed that they stepped in, with the U.S. assisting in the name of fighting terror. If Houthis succeed, which is impossible, then Saleh could continue in power. Experts have already called this Saudi Arabia’s Vietnam. Tactically, geographically, it is relatively similar, and therefore extremely unlikely to be successful. But, if Hadi is put back into place, then a very similar situation will continue, with al-Qaida holding its presence, targeting both Houthis and the regime, indefinitely, for a dissatisfied population. This is a nation that needs to focus on social stability, food production, and water conservation. It can’t do that with any of these factions. It could take years to build a government, and the water crisis should have been handled years ago. I am no more clear about who is running Yemen than anyone else, but if you trace the contradictions far enough, you should begin to see the power in the shadows. The wheel of this story will turn all kinds of corners, but eventually it gets somewhere and parks.